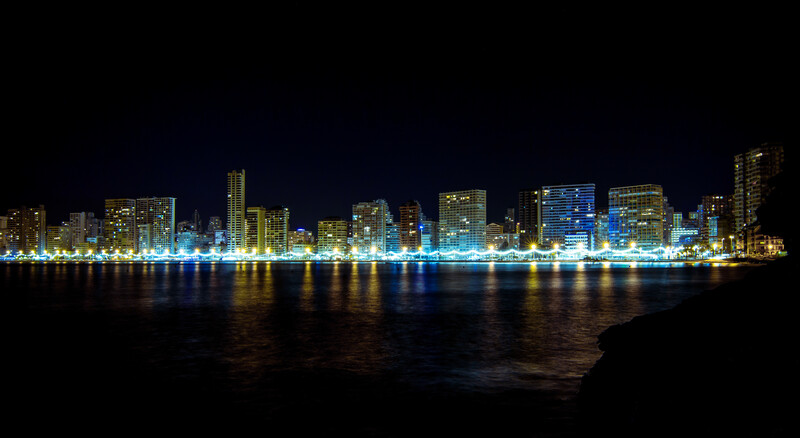 Benidorm, the skyscraper city. The higher one in Spain, it has 27 buildings above 100 meters. It also has the honor of being the city with more skyscrapers per citizen. And the second one with more of these per m², just behind Manhattan. The race for the highest building in the city begun in 1969, when Torre Coblanca (94 m) was built. Another “tower” Torre Levante took the first position in 1985 with 120 m. It was in the 2000 decade when the skycrapers really increased their number and became very popular. Most building of this age are in the highest building top ten in Benidorm. Such as Mirador del Mediterráneo (123 m), Neguri Gane (145 m) and Edificio Kronos (150 m). Nowadays, the first position is for the residential building In Tempo, with 200 m and 52 floors. The second and the third place are for the Gran Hotel Bali (186 m) and Torre Lúgano (158 m).There was a rumor during the construction of In Tempo that said that the building had no elevators, but it was denied. This building has the 5th position in the highest building ranking in Spain. Come to our great Sandos Monaco Beach Hotel & Spa and feel amazed by the wonders of Benidorm and the story of its constructions. Aditionaly, you can enjoy the best All Inclusive in the city!